The OTP 3-prong is standard sized with round pins and is available color-coded for thermocouple or white for uncompensated 3 wire and 3 pin TC connectors. These quick disconnect plugs and jacks provide reliable connections between thermocouple, RTD or thermistors and extension wires. The color-coded bodies are molded of high performance glass-reinforced nylon. Tubular plug prongs and collet-type jack inserts have low mass and reduce temperature gradients. Negative prongs and inserts are larger than positives to insure proper polarity upon connection. 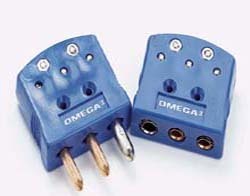 This is a standard feature on all OMEGA™ connectors. Recommended for most applications requiring three-wire circuits, including shielded thermocouples, thermistors, and RTD's. Especially useful for continuing thermocouple shield leads through panel jacks. Will withstand ambient temperatures to 220°C (425°F). High-impact construction. For strain relief and other accessories see Related Links below.